The Fog Horn is the first new iPad magazine I’ve subscribed to in a long time. I saw it mentioned by David Sparks at MacSparky, it sounded promising, and this morning I gave it a look. And I’m very glad I did. In fact, I’ve been hooked since the About page, which promises everything I should’ve been looking for all along in an iPad magazine. I’m always telling friends that I’m a bit ashamed that I never find time for any real reading that’s not work related – that basically all I’ve read for years now is books about technology. Welcome to The Fog Horn. We’re a fiction magazine, publishing four original short stories every month, twelve months a year. It’s just impossible to squeeze in a novel these days. We’re always on the move: wake up late, race around for twelve hours, and then hit the pillow with five minutes of quality reading time left before everything fades to black. I’ve always loved short stories, or at least always until I started becoming a work-related only reader. Now that I do the vast majority of my reading on my iPad and other mobile devices, this is a promising way to get myself back into some proper reading for pleasure. I’m two stories into Issue Number 1 and happily subscribed for more of this each month. 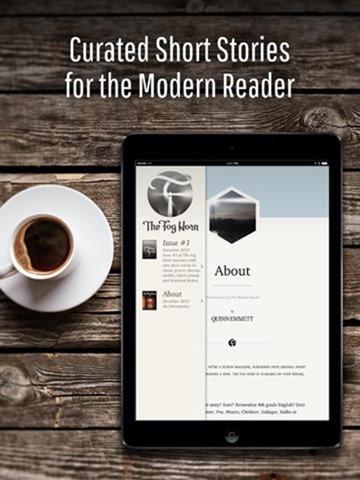 Here’s an App Store link for The Fog Horn; it’s a free Newsstand app with a subscription price of $3.99 per month. There’s a 7 day free trial and you cannot buy individual issues.